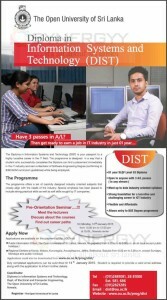 The Diploma in Information Systems and Technology (DIST) is your passport to a highly lucrative career in the IT field. The programme is designed in a way that a student who successfully completes the Diploma can find a placement immediately in the IT industry and earn a Bachelor of Software Engineering Degree (confirming to IEEE/ACM curriculum guidelines) while being employed. The programme offers a set of carefully designed industry oriented subjects that closely align with the needs of the industry. Special emphasis has been placed to include strong practical skills as well as soft skills sought by IT companies. Duly completed applications can be submitted till 14th January 2015. Student is required to provide a valid email address along with the application to inform further details.